Summer has official started now and kids are off school. So are you wondering what to make to feed your hungry monsters? Well, this is one absolute delicious and mouth-watering options. This recipe is guaranteed to satisfy not just the little ones, but also all the die-hard food lovers out there. 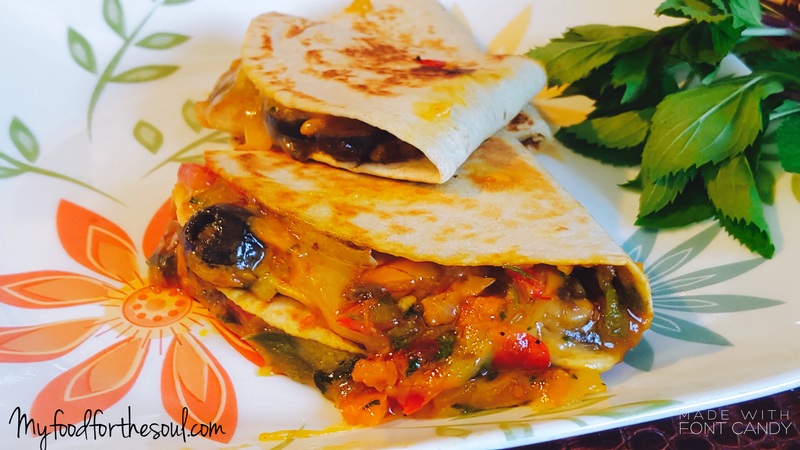 Salsa-Veggie Quesadilla is a super quick and easy dish to prepare either for lunch or a nice weeknight meal. Any choice of vegetables (I used colorful bell peppers, red onion, mushroom, green onion, grated carrots and black olives) sautéed in Mexican seasoning with an added touch of Salsa and stuffed into Tortilla topped with loads of Tex Mex Marble Cheese and roasted till nice golden brown and melted cheese. I’m one that loves anything with melted cheese and when it comes to Mexican food ……LOVE IT ! I think with quesadillas you can never go wrong, it’s like eating a sandwich, but even better. When I think of quesadillas, it reminds me of wraps and frankies; the only twist here is that it’s completely Mexican. As far as making quick and easy meals, it doesn’t get any better than making quesadilla. 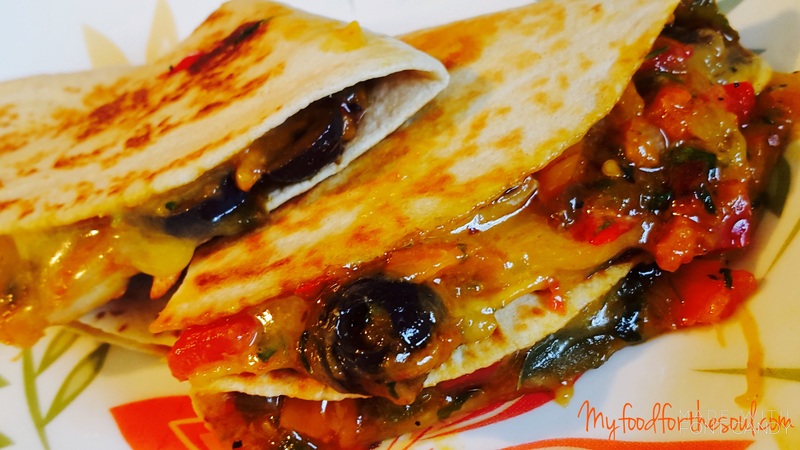 Quesadillas by far the most simplest meal to prepare; all that’s need is flour tortillas filled with your favorite filling and cheese, folded over, and heated till nice and golden brown crispy, cheese melted to perfection in no time. The best part of quesadillas is that there are endless incredible fillings with many variations, plus you can customize the filling to ones own individual tastes. 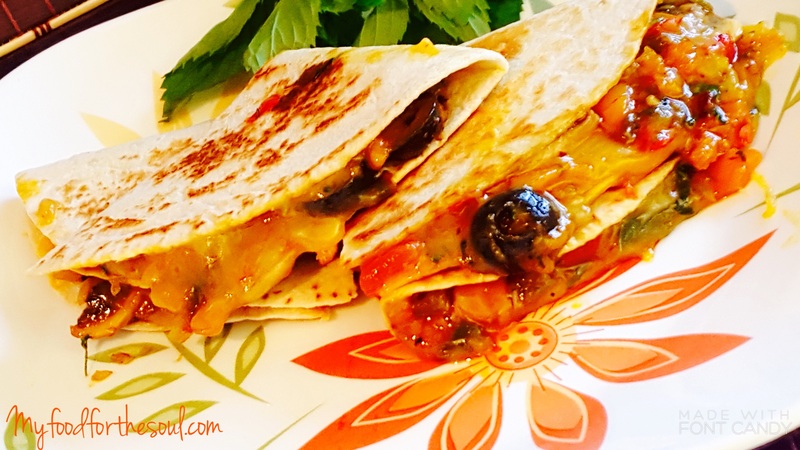 Quesadillas are not just versatile when comes to fillings, they versatility extends to the way they are cooked ; they can be pan-fried, Panini pressed, baked or even grilled. To me the best part of a quesadilla or a grilled cheese sandwich is went the cheese has leaked out of the edges and fried against the tortilla or bread; that’s when I know how heavenly this must taste! In a large skillet over medium heat, heat oil. Add chopped red onion, stirring occasionally, until the onions are turning translucent. Add all of the vegetables and cook, stirring occasionally, until tender and turning golden, about 5-6 minutes. Add in burrito seasoning, pepper, red chili flakes and salt to taste, stir and let it cook for about 2-3 minutes. Add in red salsa and fresh coriander leaves and stir. Remove from heat and keep aside. Divide 1 cup shredded cheese between the 4 tortillas, covering only half of each tortilla with cheese. Divide the salsa veggie mixture evenly on top of the cheese on each tortilla, Top all of that with 1 cup shredded cheese, divided equally between the 4 quesadillas. Press the other empty side tortilla halve over the toppings. Heat a medium to large skillet or fry pan on the stove over medium heat. Place one of the filled tortillas onto the pan. Cook for a few minutes, and then flip carefully with a spatula. Flip and cook the other side for a couple more minutes if necessary, until both sides are a nice, crisp golden brown. Let the quesadillas cool on a cutting board for a few minutes, and then slice quesadilla into three slices using a pizza cutter or a very sharp knife. Please let me know how it turned out for you! Leave a comment below and share a picture on Instagram with the hashtag #myfoodforthesoul! Also, leave me your comments, thought or feedback on this ….your ideas keeps me motivated.